Argus Heating stock and distribute a large range of resistance wire and ribbon, including Nichrome N80, and Kanthal A1 and D.
Heating elements for industrial furnaces, kilns, and electric heating appliances can also be designed and manufactured. Longer lengths of resistance wire (more than 30m) can be cut and re-reeled to suit your requirements. The selection of Nichrome or Kanthal wires should be based on the particular application. Contact us for assistance with the correct selection. Mechanically stronger than Kanthal A1 or D.
Non-magnetic ideal for low temperature applications. 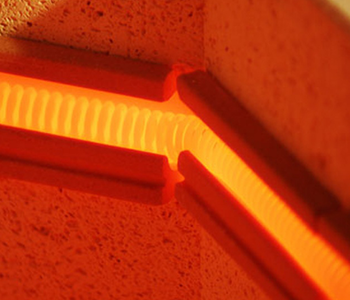 1200ºC maximum continuous operating temperature. Maintains shape at high temperature. Better resistance for sulphur and oxidising atmospheres. Highest resistivity — lightest material for given power. 1400ºC maximum continuous operating temp. Higher resistivity — lighter material for given power. 1300ºC maximum continuous operating temp.